What a great photo of their first day back to school. Such big smiles! How great that they loved it! It really is amazing the difference that a year can make. How exciting for both them and you! Enjoy your runs Mom! Wow! The boys classroom sounds really wonderful. I am so glad they like school this year. They look so happy and so adorable! these are the cutest little ones ever!! A good pre-school really helps them get a head start on entering school. They pick up a lot of social skills as well as reading. You will eventually get used to the quiet though. I sure do bet it is so awesome to have a few minutes to your self. I remember the feeling when I got all for children off to school at the same time. I was so lost. Thats when I decided to go back into teaching. I hope you have a great day. That's great they love school. My boys are the same way. They have each other, which makes them feel a little more secure I'm sure. My boys have gone to preschool with their cousins that are the same ages as they are. I bet it felt great to watch them confidently begin their new school year. glad they're excited! and yay for some free time for you!!! So cute...no tears does mean they are growing up! Such a sweet picture of the boys with their smiles and backpacks! Their classroom sounds cool and fun. Awww, those little cuties! How sweet. Does Pierce go the same school? Look at those big smiles! Their classroom sounds amazing! That's great they don't cry this year! They grow up so fast in a year. I am glad they are having an awesome experience at the start. Ya for some free time for you, too! Win Win! What a couple of cutie pies!! The ironic thing about kids is that the older they are on the first day of school, the less they cry but the more the parents do:) I can't believe Amy only has this year and then next and then she's college bound. I'll need tons of kleenex! So glad there was no tears! It's great that you will have some time for you. My son loved preschool, probably because he's an only child and loved socializing. :) Adorable picture! Fun times, it sounds as if they matured a lot from last year.Tough to let the go I bet, but nice to have some time for yourself. Yay for happy beginnings, and it does sound like a wonderful place where they attend! awww hope they had a great day! Oh Lisa, they are so cute! I am so happy for you and them! They really grew up quickly! You must be so proud Mom! It's funny how quickly they get adjusted to their new adventures. Glad to see they're enjoying it. Hopefully the smiles will keep coming. Yea for them AND for you! A little free time for the mom is always nice. They have grown up so big.. 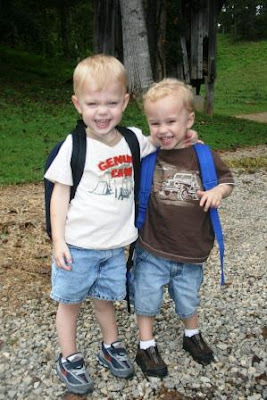 So glad they are happily going to pre-school this year with no tears.. Less stress for you. The free time you will be having well be a blessing for you.. Do whatever your heart desires.. They are so lucky to have a great little school...you too..run fun! They sure do look excited don't they. Very cute Lisa!! Aww love this photo!! THey are seriously too cute. Oh my goodness the boys are so cute - good luck in school! So fun! I can't wait for thos days! Have a wonderful weekend! Sounds like they go to a really fun preschool. Time for mama is so precious! That is so good for them. They look so cute. I have laugh at my blogging friends children because they always have the biggest cheesy grins on their faces!